I just installed windows 8 to try it out and the game runs fine on it. Step 1. Right click the demo of the game and run as administrator. Step 2. Install as normal. Step 3. Right click the unified installer and run as admin. Step 4. Allow it acces to the internet to install the files it needs. Step 5. Windows will want to install a updated file and you will have to reboot your comp before you can run the launcher. Step 6. Reboot your comp after installing the unified installer and windows updates it files. Step 7 Update the launcher and the game. Run the launcher and let it update and restart and update the game. Step 8. Run the game. Make sure it runs adequately it runs on this hp compaq nc8430 with the default video card drivers in 8.. 4-6 fps but it runs. Step 9. Update your video card drivers as needed. I used the vista 64bit drivers from hp in my case more modern vid cards update from amd or nvidia or your laptop manufacturer. Follow my guide about the taskbar and net7config.exe Make sure everything listed is set to run as admin/windows xp sp3 etc task bar never combine enable aero peek etc. This is the basics of running e&b on windows 8. I ran into a issue with windows 8 and my laptop keyboard setting. CDel and I were experiencing a problem where if we hit the " ' key ( key left of the enter key) we would get error messages Not Subscribed to a Private channel. The cure is simple. Open your control panel ( hold your mouse over the lower right corner of your taskbar (right of the clock) / click on the Gear/setting button / Open Control Panel / Open Languages(click on small icons in the upper right corner as needed to see the Languages craplet) / Click on add Language / Find, in my case, English / Double-click on the icon and find your language setting, in my case it's English (United States). Click on it and click add at the bottom right of the window. I removed the other languages (us international and english uk) and the problem went away and my typing issues went away. I get this question a lot people do not understand how to restore a collapsed window or to move a window and I get asked how.. This is how you do it I pointed out in my setup tutorial to set up your taskbar and why you turn aero peek on this is the easiest way for me to explain it.. If anyone else wants to add comments or tips and tricks for windows 8 this is a good place to put it. Maybe we can talk one of the forum mods to pin this one also since it's going to start becomming more and more important as people get laptops and new computers with windows 8 on them. where do you download service pack 3 for windows 8? and also where is your guide for taskbar and net7config.exe thing? Copy installation folder for Earth and Beyond. Copied it to a thumb drive from my own machine, to the extra machine I have with Windows 8 Pro. This installation had all the current updates at that time. On the Windows 8 Pro machine I copied the Earth and Beyond directory into the Program Files(x86) directory. I then gave full control to all users. I then installed the Net 7 unified installer. I skipped the updating the client, but ran everything else. After the installation was finished, I set the Net 7 folder to full control for all users. I also set the LaunchNet7.exe, net7proxy.exe and the client.exe all to run as administrator and use compatibility mode of Windows XP Service Pack 3. After that, all worked fine with no issues at all. Didn't use the single quote " ' " as magoo did, for whatever reason :), so I had no issue with that. That is nice you have all the luxury of copying Enb over but i don't, so i'm starting from scratch. How do i get windows server pack 3 and how do i set everything to full control to all users? Set the Run as Administrator and run in compatibility mode Windows XP service pack 3. In this directory you will find a "client.exe" without the double quotes " ". Left click on client.exe to select the file, you only need to single click this. Double clicking will execute the file, which does no good. Right click the client.exe file, and then on the menu that pops up, scroll down and select the Properties option. When the Properties window opens up, look at the options in the tabs at the top. Find the one that is labeled Compatibility, and click the label. In the drop down box you will look for Windows XP Service Pack 3, and select that option. Now look for the Privilege level Title, in her you will check the box for Run as Administrator. Now, this is very important, DO NOT forget this step. Click on the Apply button to SAVE these changes. Then click on the OK button to exit. Now, you should do this for the Net-7 launcher also. Look for LaunchNet7.exe, and left click ONCE to select the file, then right click and follow instructions above to set run as administrator and compatibility mode. IF, and ONLY IF you are still having issues, post back here and I'll tell you how to setup the game folder and the net7 folder to allow all users to access them. No need in giving you more information than you need. Lets take this one step at a time, and we will get you in game!!! :) which is what we all want. If you need more help PM me or just post back in this thread. where enb.msi is the name of the msi file (defaults to Earth & Beyond.msi but had to change it to work) it will install the files silently into the targetdir. 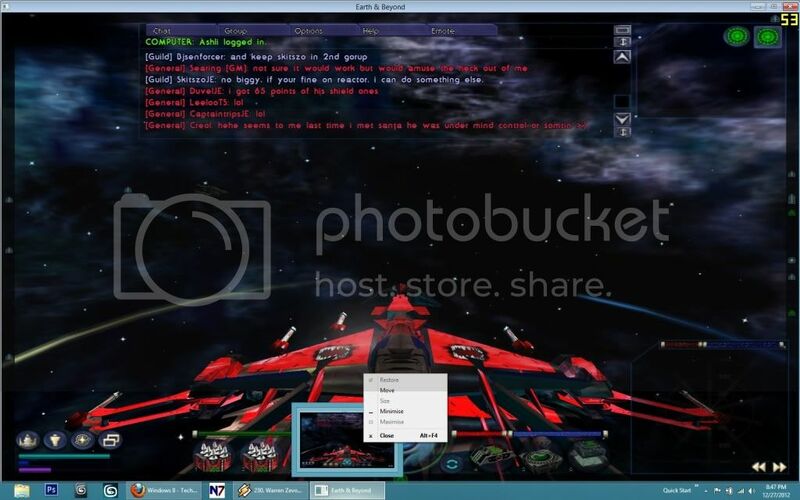 Did you look to see if you could get the Starship creator to work with Windows 8? Every time I try to start it I get a message about not having Directx 8 or a 3D card. I have set "run as administrator" and used XP SP3 compatibility mode (I have actually tried every mode). Though this may be a problem with my computer because a lot of my mid 2000 games won't run. So, let me get this straight... you can only play in window mode for windows 8? okay, how about this. my char info text is glitchy in appearance, text unreadable in certain sizses... there is no fix for this? Right click on Desktop, pick "Change Resolution"
Then click on the text link below about "Change Text size"
I got everything re-installed and the game appears to start. However, Megan now tells me that my login information is not accepted. Not sure why. is this something a GM needs to fix? I've been doing remote trouble shooting on computers updated to windows 8.1 and have ran into a few times where the net-7 launcher will not update. You go thru and remove the text files and it wont update kinda problems. So What I can do it drop the updated net-7 folder in here and you essentially copy and paste the files into the net-7 install folder. Big thing is make sure if you run a third party firewall that you allow it thru .. Here is the current net-7 folder updated to Jan 7th 2014. I'll try to rememeber to update this every month or two. Contact me in teamspeak(ts.net-7.org) or ingame if you need some help trouble shooting the game. I use teamviewer for remote work. I've been playing on windows 8 and most recently windows 8.1 with no problems what so ever. Just in case anyone was dubious about using these operating systems. I recently installed on a win 8 laptop that has been updated to 8.1. It opens and plays fine so far but Its in a very small window. I have tried everything i can think of including checking and un-checking windowed mode, changing resolutions and running all as administrator with xp service pack 3 compatibility. I would appreciate any ideas on fixing this, the small window isn't worth playing. I have a few days to return the laptop for a full refund and i have been evaluating it. so far i like it but this could make me decide to return it. did you run the performance test on the config program? it wont change anything unless you do. runs fine on windows 8.1 after i disabled the ip6 and checked the prototype reorder in the net 7 launcher. I had this problem installing on a Win 8.1 today. Had to set EnBConfig to run as administrator and also run the performance test to get a full size window.